The purpose of the study was to determine the effect of the oral treatment of Aloe Ferox (Cape aloe, bitter aloe, red aloe) extract on the gastro-intestinal parasites and ticks of weaned Angora goat kids. The two treatments were compared to an untreated control group. A Faecal egg Count Reduction Test (FECRT) was conducted to determine the efficacy of the treatments and Faecal Egg Counts (FEC) were carried out to determine the effect of repeated monthly treatments. The faecal samples were analysed by Grootfontein Laboratory. 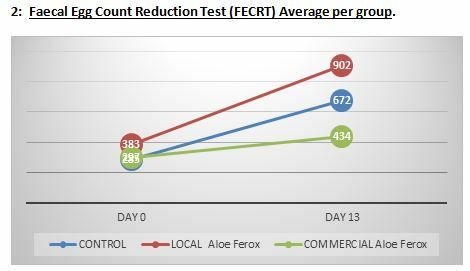 Both the Aloe ferox treatments were ineffective in reducing the Roundworm egg counts (FECRT 0%). Aloe Ferox Bitter Powder and locally produced Aloe ferox extract did retard the rate of increase of egg counts with the commercial Bitter Powder extract having better inhibitory effects. Gastrointestinal parasites are one of the major causes of deaths and production losses in Angora goat kids. The development of anthelmintic resistance to chemical doses and a trend in farming to use natural products has led to a number of farmers using either a commercial Aloe ferox or ‘home made’ oral doses to treat their small stock for parasites. Studies conducted by the University of Pretoria (Aloe ferox Bitter Powder Organic Aloe Product in vitro anthelmintic assay report 10 July 2006) indicated that extracts of the Aloe Ferox powder supplied by Organic Aloe showed inhibitory effects on two roundworm species in laboratory conditions. However studies using live animals were still needed to validate the effectiveness in vivo and determine the concentration needed to be dosed. A limited In vivo validation of Aloe ferox in goats had been carried out (Maphosa and Masika) at Fort Hare University on a very small sample number (n=6). On total mixed infections Faecal Egg Count Reduction percentages (FECR%) were observed with the extract of A. ferox on days 3 (53%), 6 (54%) and 9 (58%) at 500 mg/kg. Date and site of study: The trial was conducted over the period January to March 2014 on the farm ‘Longacres’ in the Graaff-Reinet district belonging to Brett Walker. These were obtained from Angora goat kids not previously dosed or treated for a month prior to the start of the trial. 150 weaned kids born August 2013 (5 to 7 months old over the trial period). The kids were grazing on karoo veld and weighed 13-17kg. Protocol: The kids were randomly divided into 3 groups of 50. Each group was clearly identified with an ear tag. Dosed as per manufacturer’s instructions: 60-80g of Aloe Ferox Bitter Powder (which is a spray dried sap) which is diluted in 5 litres of luke warm water. 10ml of this is dosed every 4-6 weeks as per manufacturer’s recommendations. This equates to 16mg/ml (160mg/10ml). Freeze dried product reconstituted according to manufacturer’s recommendation. Local manufacturer recommends 10ml dose to adults and 5ml to kids. The kids in this trial were dosed with 8ml of product. 13 days after treatment to evaluate a faecal egg reduction test (FECRT) as is done to evaluate the efficacy of commercial anthelmintic product. The faecal samples were analysed at Grootfontein Agricultural College laboratory with thanks to Ilze Venter and Gretha Snyman. 2: Faecal Egg Count Reduction Test (FECRT) Average per group. The control group (Blue line on graphs) demonstrates the seasonal fluctuation of the parasite burden at the time of year in which the trial was conducted (January to March 2014). 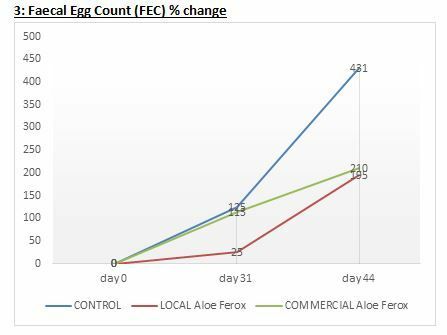 The Aloe Ferox extracts did not reduce egg counts in the FECRT burdens (table 1). However the commercial Aloe Ferox Bitter Powder (Green line on graphs) did retard the rate of increase to 46% against the control’s 135.8%. The locally produced extract (Red line on graphs) did not retard the rate of increase significantly and the group’s FEC was almost the same as the control (138%) when the FECRT was carried out. 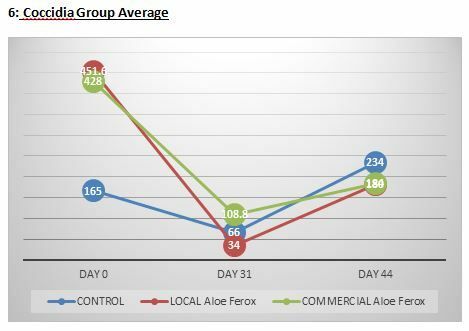 When evaluating the FECRT it is evident that neither of the Aloe Ferox products would be considered an effective treatment relative to other commercially available treatments at the dosages used. To be considered to be an effective treatment a Faecal egg Count reduction of >95% would be expected. 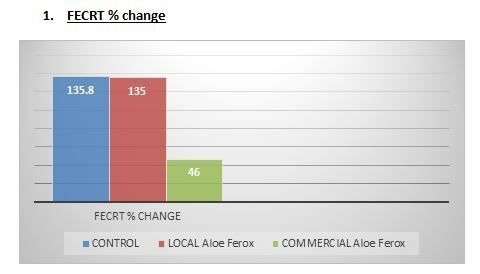 An increase in the FEC post treatment with Aloe ferox was obtained in this trial so the FECR would be considered to be 0%. With repeated treatments the extracts again failed to reduce the FEC but significantly retarded the rate of increase (195% and 210%) against the control of 431% by day 44 (table 3). The Aloe ferox bitter powder extract had a significant effect in inhibiting the rate of FEC increase (table 4). Results of the coccidian oocyst counts are difficult to interpret in light of the significantly lower starting point for the control group. 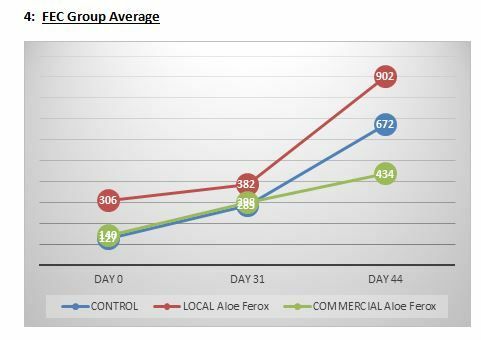 Both the Aloe ferox extracts reduced the coccidian oocyte count after repeated treatments (-57%,-60%) while the control group increased by 41.5% by day 44 of the trial (Table 5). However the counts increased after the second treatment which again suggests an inhibitory effect on oocyte numbers. The overall reduction was largely due to the environmental decline as seen in the control group of -60% by day 31. 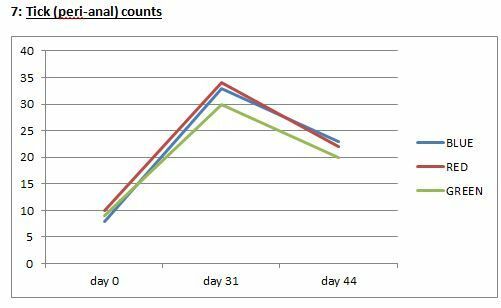 A further reduction in coccidia counts was not achieved by the Aloe ferox extracts when evaluating a FECRT (FECRT 0%) 13 days after treatment. 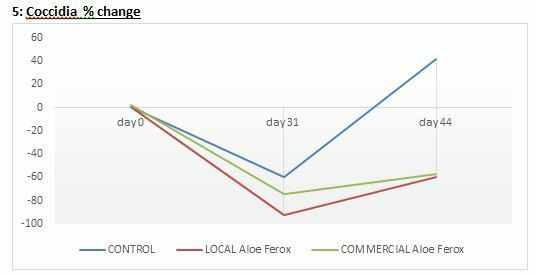 The tick counts (table 7) follow the environmental conditions (control group) closely and no statistically significant effect of the treatments on tick numbers can be attributed to the Aloe ferox although percentage changes do favour the Aloe ferox treatments marginally. Neither of the Aloe ferox extracts would be considered to be an effective tick treatment from the results in this trial. The recommended dose of the Aloe ferox bitter powder extract by the manufacturers (60-80g diluted in 5 litres of which 10ml is dosed) equates to 16mg per ml and so in effect each kid on average (15kg) receives 10.6mg/kg. This is a very small dose when compared to the small Fort Hare trial where dose levels of 500 mg/kg were used and a roundworm FECRT of 58% was achieved with reductions in coccidia oocysts also observed. If significant increases in dose levels are to be made the side effects of Aloe ferox must also be considered. The exudate of Aloe ferox contains 15–40% anthrone (aloin) the compound responsible for the laxative properties. Possible side effects of aloin include congestion and irritation of the pelvic organs. Anthraquinone containing laxatives such as aloe may play a role in colorectal cancer as they have shown genotoxic potential and tumorigenic potential in rodents. Aloe ferox extracts do inhibit the rate of development of both roundworm and coccidian to a limited extent and in so doing may allow the goat to develop its own immune response through exposure to intestinal parasites. The inhibitory effect will also be likely to reduce the contamination of the environment with viable roundworm eggs and coccidian oocytes. As a treatment for ticks it is ineffective. Further evaluation of Aloe ferox extracts at much higher dose rates may show improved efficacy and potential as an effective treatment for internal parasites. In light of the trial results, it would seem unlikely that Aloe ferox would be an effective treatment for ticks even at a higher dose rate. Aloe ferox has the potential to play a role in retarding the development of excessively high gastro-intestinal parasitic burdens and reduce the frequency of synthetic anthelminthic use. However as a treatment measured against accepted pharmaceutical standards it is not effective. 1:In vivo validation of Aloe ferox (Mill). Elephantorrhiza elephantina Bruch. Skeels. and Leonotis leonurus (L) R. BR as potential anthelminthics and antiprotozoals against mixed infections of gastrointestinal nematodes in goats. Kambizi, L., Sultana, N. & Afolayan, A.J., 2004. Bioactive compounds isolated from Aloe ferox: a plant traditionally used for the treatment of sexually transmitted infections in the Eastern Cape, South Africa. Pharmaceutical Biology 429(8): 636–639. Newton, D.J. & Vaughan, H., 1996. South Africa’s Aloe ferox plant, parts and derivatives industry. TRAFFIC East/Southern Africa, Johannesburg, Republic of South Africa. 61 pp. Bayne, H.J., 2002. FDA issues final rule banning use of Aloe and Cascara sagrada in OTC drug products. HerbalGram 56: 56–59.